Rabbi Meir Auerbach (1815-1878) was born in Kovel near Kalish, an important city in central Poland into a family who for centuries produced great rabbis. He was a descendant of Rabbi Shloma Zalman of Poznan who lived in the latter part of the sixteenth century. Rabbi Shloma Zalman authored many scholarly works and was recognized in his generation as a holy man. Rabbi Meir Auerbach's father, Rabbi Yitzchak Isaac Auerbach who passed away in 1846 was the Rabbi of Polotzk and Luntshitz and authored the sefer Divrei Chaim. Rabbi Meir Auerbach himself was a towering Gaon in Talmud. He became rabbi of the city of Koval in 1840 at the tender age of 25. In 1846, Rabbi Auerbach was appointed president of the Jewish court din in Kolo, where he served for nine years. He later became the Chief Rabbi of Kalisz/Kalish for four years. In 1860 after relinquishing the Rabbinate of Kalish to Rabbi Chaim Elazar Wax, Rabbi Meir Auerbach travelled to Israel and settled in Jerusalem. Rabbi Shmuel Salant, the chief Rabbi of Jerusalem, was about to embark on a lengthy voyage to Europe on behalf of the impoverished communities in Israel, He appointed Rabbi Meir Auerbach to serve as Chief Rabbi in his absence. After several months, when Rabbi Shmuel Salant returned, Rabbi Auerbach was prepared to relinquish his role as Chief Rabbi of Jerusalem back to Rabbi Salant. Rabbi Salant, in his keen wisdom and insight saw the tremendous benefit of having Rabbi Auerbach involved in communal affairs. He convinced rabbi Auerbach that since he was caught up in overseeing the financial viability of the community he therefore had little time to fill his role as sole Chief Rabbi. He thus persuaded Rabbi Auerbach to stay on as the assistant Chief Rabbi of Jerusalem. As assistant Chief Rabbi, Rabbi Auerbach assisted Rabbi Shmuel Salant in the spiritual and material wellbeing of Jerusalem and continued to play a most critical role in all the communal affairs of the country. Rabbi Auerbach also played an essential role on the Jerusalem Rabbinical Board of Directors of the Rabbi Meir Baal Haneis Salant charity founded in 1860 by Rabbi Shmuel Salant. The Rabbi Meir Baal Haneis Salant archives contains hundreds of letters from all over the world that were written to him in his capacity as a Rabbinical Board Director of the Rabbi Meir Baal Haneis Salant charity fund. Rabbi Auerbach had made investments in several successful enterprises in Poland before he emigrated to Eretz Yisroel and made a comfortable living. He therefore refused to take any salary from his rabbinical functions. On the contrary Rabbi Auerbach freely distributed charity to institutions and individuals, especially widows and orphans. In 1866 when the cholera plague rained death and destruction on Jerusalem and all the various Ashkenazy groups and organizations were in disarray, Rabbi Shmuel Salant and Rabbi Auerbach felt that it would be an urgent need and tremendous advantage to the entire city to create an umbrella organization which would unite all the various factions and which would work harmoniously and in unison for the benefit of the Klal. Thus was born the Vaad Haklali which eventually became the central institution which dealth with all Jerusalem's issues, both financial and spiritual. Rabbi Auerbach was revered as a great man by all the foreign diplomats who had offices in Palestine, particularly the Russian Consul. Once an incident occurred that the crown prince the son of the Emperor of Russia Alexander II became ill. The Emperor sent a request to Rabbi Auerbach via the Russian Consul that he gather together a group of scholars to pray for the welfare of his son. Rabbi Auerbach complied with the royal request and sent a telegram to the Emperor with his promise that the boy will get well. At the very moment that the Emperor read the telegram, the royal physicians came to inform His Highness that his son was miraculously coming out of danger. As a token of his appreciation, the Emperor sent Rabbi Auerbach a personal handwritten letter thanking him for the prayers. He also included a gift of one thousand rubles to distribute to the poor scholars of Jerusalem. Rabbi Auerbach was extremely devoted to the continued growth and welfare of the growing population in Jerusalem and sought to open up new neighborhoods for expansion. With Rabbi Shmuel Salant he assisted Rabbi Yosef Rivlin and Rabbi Yoel Moshe Salomon in building the neighborhood of Nachalat Shiva, which was the first Jewish neighborhood of Jerusalem built in modern times outside the walls of the Old City. The cornerstone laying ceremony for the new neighborhood took place on Lag B'Omer, the 18th of Iyar in the year 5629 (1869), and by 1875, some 50 Jewish families were living in the area. He also took center stage in the establishment of the neighborhood of Meah She'arim. Rabbi Auerbach was very beloved on all segments of the community. He was appointed as Honorary President of the Yeshiva Etz Chaim, the Bikur Cholim Hospital,and the Churvah shul Beis Yakov. 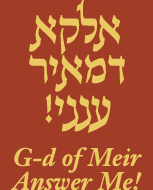 His reputation as a great scholar is evident by his monumental work on the Shulchan Aruch called "Imrei Binah". Rabbi Auerbach instituted a restriction in Jerusalem on playing musical instruments at weddings as a sign of mourning for the Destruction of the Holy temple, a custom which is still upheld. Unfortunately, on the third of Iyar in 1878, Rabbi Meir Auerbach passed away at the relatively early age of sixty three. Rabbi Shmuel Salant once again remained alone to lead Jerusalem Jewry. May the memory of Rabbi Meir Auerbach be a blessing.